Florence Augusta Merriam was the youngest of three children born to Clinton Levi Merriam and Caroline Hart Merriam on August 8, 1863 in Locust Grove, Lewis County, New York. Their middle child, Clinton Hart Merriam (better known as C. Hart Merriam) became the first chief of the United States Biological Survey. Florence’s father, a close friend of John Muir, had a keen interest in natural history and encouraged his children to study nature. As a child, Florence took an avid interest in the wildlife surrounding her home, especially birds. Florence attended Smith College from 1882 to 1886. However, prior to entering Smith, she already had a passion for studying bird behaviors. At that time, most naturalists studied birds using their "skins" which were usually housed in private collections. Florence championed the study of live birds and is considered the first to propose using binoculars when birding. By 1885, she began to write articles focusing on bird protection. She was horrified by the common fashion trend which used feathers and even entire birds as hat decorations. An estimated five million birds a year were killed for this purpose. Moved to publicize this slaughter, Florence organized The Smith College Audubon Society. Through her efforts, a third of the student body distributed circulars and wrote passionate protests to newspaper. Eventually, along with additional efforts by national organizations dedicated to ending this hat decoration method, laws were passed outlawing the practice. Following college, a bout with tuberculosis sent Florence west to convalesce. After a winter in California to improve her health, she and her mother joined her brother, C. Hart Merriam, for a trip to the Pacific Northwest in 1889 as part of her brother’s mammal studies on the Olympic Peninsula. By this time, C. Hart Merriam was already a well-known naturalist and had been named the founding chief of the U.S. Biological Survey (1885-1910), the federal government's first natural sciences agency, which later transformed into the U.S. Fish and Wildlife Service. Florence collected and developed the series of articles she had written for the Audubon Magazine into her first book, Birds Through an Opera Glass, published in 1889. This book was published under her own name, which was unusual for women at the time. Her independent streak and desire for greater public recognition and respect for the efforts of women are reflected in her writing. In describing a female warbler in Birds Through an Opera Glass, she wrote: "Like other ladies, the little feathered brides have to bear their husbands' names, however inappropriate. What injustice! Here an innocent creature with an olive-green back and yellowish breast has to go about all her days known as the black-throated blue warbler, just because that happens to describe the dress of her spouse!" Florence traveled throughout the West. Her experiences were recounted in the books My Summer in a Mormon Village (1894), A-Birding on a Bronco (1896), and Birds of Village and Field (1898). In 1899 she married Vernon Bailey, a prominent naturalist and official in the Biological Survey. Together, they made many trips into the American West and wrote extensively on the flora and fauna. 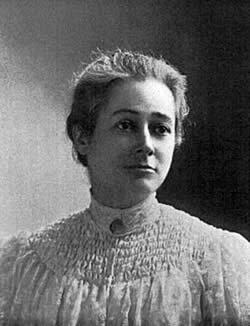 Florence Merriam Bailey published extensively, with nearly 100 journal articles and ten books to her credit. Among the books are the Handbook of Birds of the Western United States (1902) and Birds of New Mexico (1928). Her last major written work was Among the Birds in the Grand Canyon National Park, published by the National Park Service in 1939. 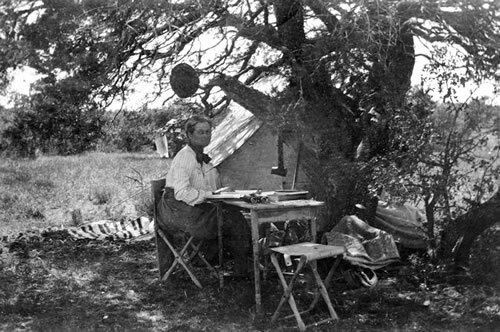 Florence was the first woman associate member of the American Ornithologists' Union in 1885, its first woman fellow in 1929, and the first woman recipient of its Brewster Medal in 1931, awarded for her book Birds of New Mexico. A variety of California mountain chickadee was named Parus gambeli baileyae in her honor in 1908. Florence Merriam Bailey died in Washington, D.C., in 1948. Biography based upon material from “Women of Courage,” a series of profiles produced by St. Lawrence County, New York, Branch of the American Association of University Women. - Bailey: Portrait from The Condor: A Magazine of Western Ornithology, volume 6, number 5 (September-October 1904), image from the Collections of the University of New Mexico. - Conducting field research in the Guadalupe Mountains, New Mexico, photo from the American Heritage Center, University of Wyoming.